Visitors to this year's Coal Country Chamber of Commerce's annual Fall Festival ­­scheduled from 10 a.m. to 4 p.m., Saturday, Sept. 24, at Benld City Park­­ will have a rare opportunity to view models of dinosaur species that have been extinct for millions of years. The display will feature dinosaur models produced by CM Studio, a local studio known for creating scientifically accurate, life­sized sculptures of dinosaurs for museums and other venues. Local residents rarely get to glimpse the studio's work­­the studio itself doesn't offer tours and one of the nearest examples of its work is a life­ sized pteranodon that soars over an exhibit at the Field Museum of Natural History in Chicago. The display will include a life­sized Tyrannosaurus Rex head, complete with a mouth filled with sharp, flesh­tearing teeth; a life­sized Utahraptor, a species similar to the velociraptors made famous by the Jurassic Park movies; and a life­sized Triceratops skull. Brian Page, one of the principal artists for CM Studio said the display also will include other specimens, depending upon what the studio has available at the time of the festival. "What's great about the display is that it lets us expose kids to some of our models that they would have to go to a museum to see otherwise," Page said. " Sponsored by the Coal Country Chamber of Commerce, the Fall Festival will feature for than 60 arts and crafts vendors, a variety of food and beverages and free entertainment. Steve Davis, whose' "Memories of Elvis" show also will feature entertainers who channel Buddy Holly and Patsy Cline, tops the entertainment schedule, along with Nashville recording artist Amy Hailstone, who grew up in Gillespie, and the Dixie Dudes and Dance traditional Dixieland music act. 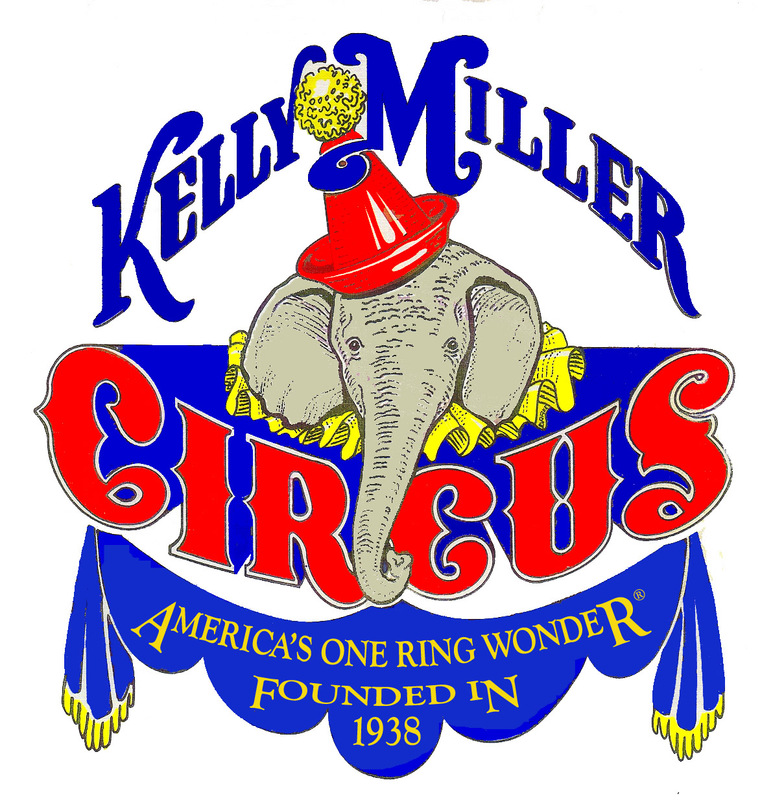 Other festival features include a petting zoo, a live reptile display where visitors can actually handle the animals and the CCCC Choo­Choo train offering free rides around the park. The annual Tour de Coal bike ride also is scheduled in conjunction with the festival. This will be the second year for the CM Studio dinosaurs to make an appearance at the festival. In addition to the display, Page said the studio plans to have inexpensive souvenir items for sale, such as printed t­shirts, available for sale this year. The studio was founded 35 years ago by Charlie McGrady, a local artist who found a niche sculpting high­end, scientifically accurate dinosaur sculptures for museums. "Charlie was into natural history and natural history sculpting, including dinosaurs," Page said. "He started to get a name for himself for the small models he was making and he decided to move into making life­sized models." Over the years, the studio's reputation has grown to the point that it now produces life­sized sculptures of 75 different dinosaur species ranging from 120 feet in length to the chicken­ sized Comsognathus–the so­called "compy" that figured in the "Lost World" movie in the Jurassic Park franchise. "People think of dinosaurs as being large, lumbering beasts, but that's not necessarily the case," Page said. Now housed in a former lumber yard warehouse, CM Studio is littered with dinosaurs in various states of completion. The process of developing a new sculpture is aborious and detailed. The studio artists work with a specialist in dinosaur anatomy who is skilled at rendering drawings that essentially add flesh and skin to the skeletons of known species. Using those drawings as a reference, the artists create a miniature sculpture that is later recreated as a full­sized model. Building the full­sized sculpture, particularly for the larger species, involves building a metal armature­­essentially a metal skeleton to hold hundreds of pounds of clay that artists use to create the creature's body.Finally, the artists use stamps and other tools to add skin texture and other details. Once the clay model is complete, casts are made with silicone rubber that are then used to cast pieces of the beast in plastic resin. Those sections are then assembled into the finished sculpture and painted. For the most part, Page said he and McGrady do the bulk of the work. "When we have a really large project, we may bring in other people to help with the sculpting and painting," Page said. Among the challenges of the work, according to Page, is keeping up with new scientific discoveries about various dinosaur species. For example, it is becoming increasingly apparent that a number of species had rudimentary feathers similar to modern day birds­­one reason many paleontologists now believe birds are directly descended from dinosaur ancestors. Evidence of the feathers is embedded in the rock surrounding fossil bones that previously was being removed to get to the bones themselves. "They were digging through the evidence of feathers and skin impressions in the rock matrix," Page said. "Now they are finding a lot of feathers because they know to be looking for them." One project­­a sculpture of a Postosuchus­­had to be put on hold temporarily as the artists awaited the release of a scientific paper addressing whether the creature walked on all fours or stood upright on two legs. The length of the front legs had led to speculation that the creature walked on four legs, but the new research revealed it wasmore likely to have walked upright­­a fact that was reflected in the final sculpture. Such changes in interpretation is not unusual. The Iguanodon, previously thought to have walked on four legs, is now known to have walked upright. One of the more unusual projects done by the studio was a recreation on a quadruped Iguanodon sculpture that was displayed near the Crystal Palace during the 1851 World's Fair in London. Though now known to be inaccurate, a wealthy client wanted the sculpture recreated for his estate on the Isle of Mann. He even directed the artists to create an open space in the animal's back for a sitting area where he and his guests could sip cocktails and enjoy the evening sunsets. 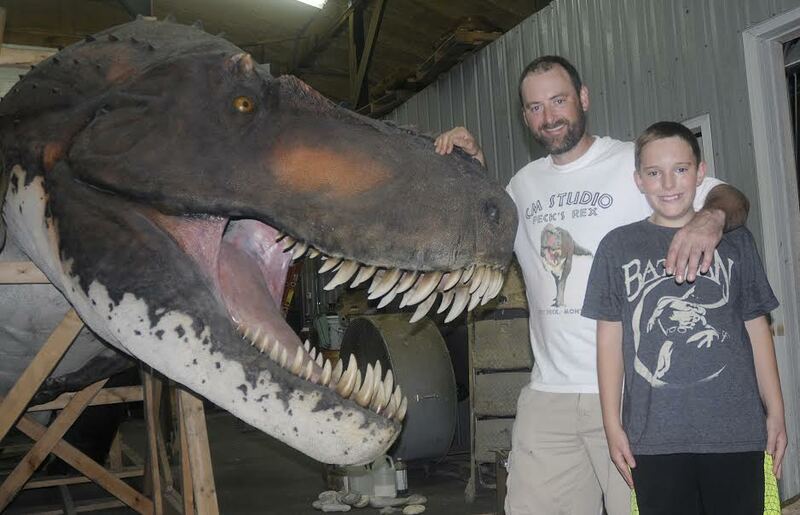 Page said the studio is proud of a life­sized model of a Brachylophosaurus, based on fossil remains discovered in 2000 that were mummified before fossilization. Studies of the fossil, dubbed "Leonardo," enabled the artists to not only duplicate the body mass of the dinosaur, but also authentically duplicate its skin texture. A photo of a the sculpture accompanied a Newsweek article about the dinosaur the significance of the mummified remains. "It's probably the most accurate reconstruction of a dinosaur ever made," Page said. Page said the studio looks forward to bringing its display to the Fall Festival in part because of the opportunity it provides for children. "There is such a thing as 'extreme inherent interests' among children, and dinosaurs is one of the things they're interested in," he said. Participating in the Fall Festival allows CM Studio to tap into that "inherent interest," according to Page, "and add some stealth education." 2016 sponsors of the Fall Festival are: Carlinville Area Hospital; COUNTRY® Financial of Gillespie ­ Tina Olroyd, Financial Representative; FNB ­ Benld Banking Center; Goodman Real Estate and Insurance Agency; Hicks Maytag Home Appliance Center of Gillespie; Madison Communications; Michelle’s Pharmacy of Gillespie; Quality Flooring of Gillespie; State Farm of Benld/Gillespie ­ Jessica Ely Agent; Sullivan Drugs, Inc.; and United Community Bank of Gillespie. 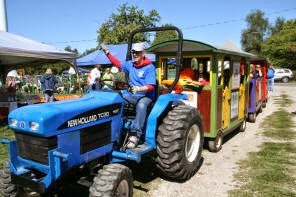 Other Chamber and community members whose services help to provide the Fall Festival are: 1st BancFinancial ­ Greg Craine, Agent; Brian Bequette Cabinetry Inc. of Benld; the City of Benld; Drew Ford; Gina Gucciardo, CPA of Gillespie; Hebenstreit Apartments Benld; Macoupin County Journal Publications; Madison Communications; Papa JoDanni’s Catering; Jodanni’s Amore’ Restaurant of Benld; Reid’s Service ­ Heating and Cooling; Roma’s Pizza of Gillespie; Wilsonville Community Outreach; WSMI AM/FM &WAOX Radio.